My parents and brother came to see me last weekend and the dilemma of picking a place to eat came upon us once again. After much back and forth, we decided on Eastern European-style cuisine, and we headed to Djerdan Burek. 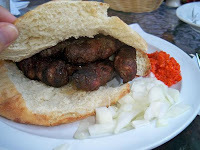 We're somewhat familiar with this food, as we used to vacation in Serbia, and this visit would take us back in time. There's not much to say about the atmosphere at Djerdan because it doesn't really exist. Everything is very plain and overall, it resembles a no-frills take-out joint. But don't be turned off by this--you'll quickly see that the food more than makes up for Djerdan's bare-bones vibe, making this place a rare, special find. There's a small "garden" in the back, with plastic furniture and fake hanging plants, but it is a nice, quiet getaway and a good place to talk. We liked how private it felt and it was like dining in our backyard--peaceful, unobtrusive and relaxing. Appetizers - We ordered a couple of things that we shared including Djerdan's famous burek, shopska salad and a veal soup. 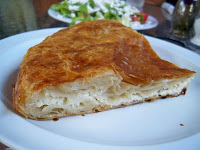 Out of those, I strongly preferred the burek, which was stuffed with salty cottage cheese. To say that it was excellent doesn't do it justice! The layered dough consisted of flaky, buttery phyllo and the top boasted a well-done blistery crust. It was a pleasure to bite into, and the cheese provided a nice contrast in texture, mixing the flaky (crust) with the soft (cheese). I'm curious about trying it with meat next time. The salad was a nice fresh start and reminded me of a Greek salad, with the the feta cheese and all. The veggies were crisp, juicy and overall, the dish offered a nice refreshment for the palate. Peter ordered warm, veal soup that was comforting and very generous in portion. He finished most of it but I had a few spoonfuls of the flavorful broth and a few bites of the slow cooked veal--it was as tender and delicate as can be. Entrees - We again ordered a bunch of plates and then passed them around for everyone to try. Our choices consisted of beef goulash, stuffed peppers, veal shish kebabs and cevapcici. 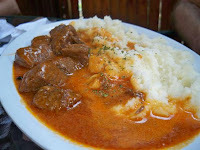 My favorite was the beef goulash, which unlike in Zlata Praha or Koliba where it's served with dumplings, came with hearty mashed potatoes and plenty of delicious beef gravy. The meat was the best part, as it was so tender that it fell apart on contact. Seasoned well and again, not too heavily salted, it was a filling dish, probably more suited for colder months. Peter's stuffed peppers were wonderful and came with a side of those yummy mashed potatoes that were also served with the goulash. The portion was impressive with two large green pepper halves, stuffed at the seams with rice and ground beef. When I took a bite, I was immediately transformed to my grandmother's kitchen - the mix of comforting flavors tasted very homemade and you could feel the love and tradition that was poured into it. I ordered my beloved cevapcici, which are tiny veal kebabs served on warm pita bread, with a side of chopped raw onions and red pepper sauce. There were so many of these lovely veal sausages that I knew I'd be taking half of the portion home. The red pepper sauce was refreshing to put on top of the meat and the onions provided a nice crunch. Although the meat came in a large pita, I liked eating it separately but that's a personal preference. If you like burgers, you'll love this. My mom got an impressive order of veal shish kebabs, which were interspersed with slivers of carrots. The presentation was interesting, and the meat was juicy and zesty--flavored with Mediterranean spices and plenty of lemon. Sides of creamy lemon rice, raw onions, red pepper sauce and a chopped salad made this an extremely generous dish. It was the most well-rounded meal, providing diversity and excitement on a plate. Dessert - It's hard to believe that we saved room for dessert, but lo and behold, we did. Our two choices were the keks torta (layered custard cake) and bombica (coconut, dark chocolate, rum macaroon). The keks torta was the more impressive of the two, offering a decadent cream filling that came in both chocolate and vanilla, sandwiched between spongy layers of cake. 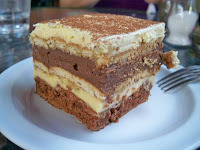 It reminded me of tiramisu, except the texture was firmer and the layers offered more complexity. I prefaced this review by saying that there's not much of an atmosphere here, and this extends to the service as well. I'm not saying that the service is bad, it's just kind of lax and not detail oriented. Things that should've been a no brainer (i.e. bringing glasses and straws with bottled water or giving us two extra forks for the dessert) had to be asked and reminded over and over. We didn't care because we weren't in a hurry, but just know what you're getting into--you have to spell it all out for them. Despite the inconsistent service, our waitress was nice and courteous. She gave us recommendations but we had to pull them out of her. I think that she just wanted to get on with it. there's another Djerdan in Midtown. Have you tried that one? Djerdan was great. From the appetizers to the delicious desserts. It felt like you were invited to your family for a meal. The only difference was that when you were saying good bye you had to pay. Thank you Foodista for good recommendation. You're welcome - so glad that you enjoyed!